Setting the bar on high quality Maryland Blue Crabs! 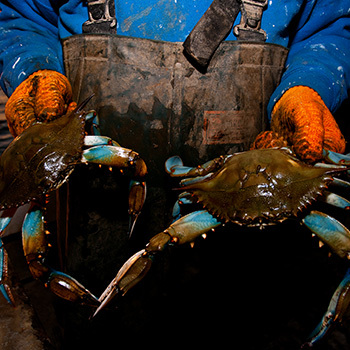 We, the owners of Coveside Crabs, are deeply committed to the ecology of the Chesapeake Bay, and to the idea of maintaining the blue crab as a sustainable natural resource for the future. We are currently conducting on site research and data collection for both the COMB Institute and the DNR. We welcome the opportunity to educate the public about the biology of the blue crab and its habitat. Lee holds a B.S. in Biology from The University of Pennsylvania, and is a former teacher. In 2014, Governor O’Malley appointed her to the Maryland Seafood Marketing Commission. She is delighted to offer small groups a tour and informal talk about crabs by appointment. Captain Richard Young is a native of Jones Creek, where his father started Young’s Boat Yard. He is well respected for his crabbing and fishing expertise on the Bay. Since the early 1990’s, he has been a commercial waterman. Governor O’Malley appointed Captain Richard to the Tidal Fish Advisory Commission. Since that time, Governor O’Malley has reappointed him for two additional two year terms. He works tirelessly on new regulations and legislations that concern all of us, who live, work and play on the bay. He is also involved in several other efforts, including a position on The Blue Crab Industry Design Team, which is working on preserving the future of our industry for a new generation. Thank you for visiting us today. We hope you truly enjoy your Coveside Premium Crabs. Think Coveside, when only the very best will do! Ready to order? Call us today or drop us a line below!